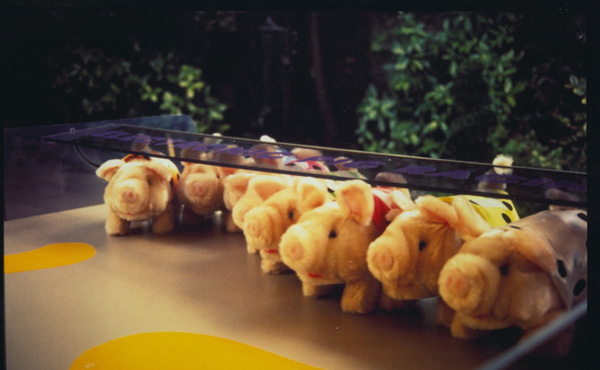 This event consists of a colourful purpose-built racing table, eight highly trained battery powered racing pigs (each in their own numbered jacket) and a charismatic and engaging host. We run a series of races over the course of an evening and the audience bets on the pig they think will win. Electronic Pige Racing is one of the events in our Millionaire By Midnight event format. Can the winning pig be predicted? Pigs can have noticable form. We don't replace the batteries at the same time and, you never know, one of the pigs may have a rogue supermarket battery on board (we can't feed them Duracell every day) and then you have the 'Wipeout', when a pig heads off at an angle and takes out its neighbours. Finally, if our host starts to notice a pattern he may surreptitiously switch jackets around. Often clients get so attached to their porker that we have to give one away as a prize for the winner. There's always one of our piggy wigs that's ready to retire from racing.